High performance storage solutions company Promise Technology today announced its first foray into the consumer electronics market with the Apollo storage bank. The new device lets users, and a personal circle of private members, store and share data collected in the Apollo with the help of a companion app available to download from the iOS and Google Play App Stores. With the Apollo app, the 4 TB storage bank lets anyone granted access to the device browse and save photos, videos, and other data from wherever an internet connection is available. Each member of the private group can also be designated private space on the bank's storage, allowing users their own designated storage area for personal content, for which they can then enable or disable more complex privacy restrictions. The Apollo also ensures customers that all of their private data will be effectively secure on the device due to encrypted transactions between the bank and its companion app, along with the data's storage location off of the Web. Within the confines of that security, the device will also let group members comment on and discuss data within the Apollo -- like pictures and videos from a vacation -- with complete privacy. 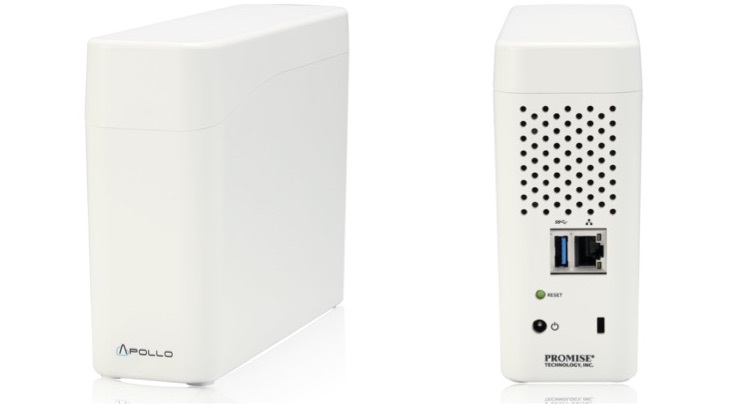 Promise Technology has yet to reveal the price or launch window for the Apollo, but the Q&A tab on the company's site does confirm the contents of the device's retail box: an Apollo unit, DC Power adapter with power cord, International plugs kit, Ethernet cable, and quick start guide. The Apollo will be available to purchase exclusively in Apple Retail stores when it launches. If I can pay $100 and just have this just work indefinitely, I'll spring on it. Edit: Oh, hey... WD My Cloud. Neat. What kind of setup in involved? Will it automatically work whether I'm on my home network or not? Like... without my having to configure my network or anything, will my computer still see it even when I'm not at home, like I can with Dropbox? If I do have to configure my network to do such a thing, how much effort is involved? I already know my home IP... I assume I just have to set up some port forwarding on my router or something? So, how is this any different from the WD Cloud? Looks like WD Cloud have more features but lacking some security/encryption that Apollo might offer. Without much more info that what they have now, WD Cloud seems like a better option still.